When it came time to walk away from three decades in the music business, Tommy Floyd wanted to retain at least some of the aspects of life in the fast lane: the lights, the sounds and feelings of euphoria. So naturally, the 52-year-old devoted himself to all things pinball. While the similarities may be difficult to pinpoint at first, the parallels are there in abundance. Floyd spent much of the ’80s, ’90s and early 2000s playing in local hard rock and metal bands, including the Canadian version of Pretty Boy Floyd, before turning his focus to the management side of the business. 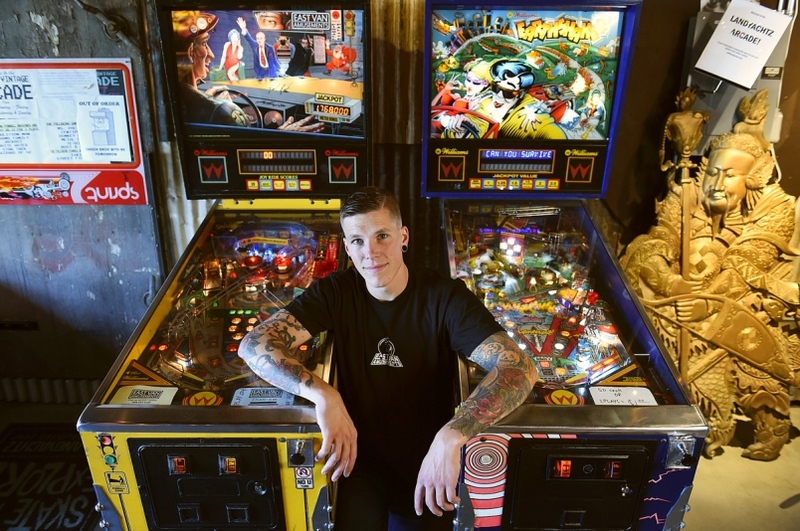 He left music a decade ago and devoted himself entirely to pinball: buying machines, organizing tournaments and selling the activity across western Canada. Now, Floyd is organizing this weekend’s inaugural Vancouver FlipOut Pinball Expo at the Holiday Inn on Howe Street. Running Sept. 23 to 25, the event will feature more than 100 pinball machines, speakers and vendors. Competitive tournaments will also be in the offing and a prize purse of $10,000 is up for grabs for those with serious pinball panache. The upcoming expo is loosely based off of pinball leagues and other shows Floyd has staged in the Fraser Valley, but on a larger scale. The Mission resident is cognizant of the stereotypes associated with arcade and gaming culture when asked what type of special nerd would line up and pay to play pinball for keeps. But as it turns out, the geeks have long left town and playing pinball is once again righteous. Jeff Radomsky is proof positive of the fact pinball’s got its swagger back. The 26-year-old serves as the operations manager and event coordinator at Landyachtz, a company that traditionally concerns itself with skateboards, longboards and the like. Radomsky helped the Union Street facility stage its first “pop-up arcade” night as a trial run right around this time last year — all of the storefront merchandise was moved to make way for pinball machines, arcade games and a night of gaming culture. The kids went wild for the concept and similar events are now routinely staged once every few months. As is the case with most cycles in pop culture, what was considered lame 25 years ago is now the hottest thing since sunburn. Given his experience in gaming culture, Radomsky is one of a handful of guest speakers at this weekend’s expo. He’ll be flanked by other international luminaries from across the U.S. and Europe who will speak to pinball’s resurgence. For tickets and more details, go to vancouverflipout.com.